IF YOU USE THIS SITE CONTENT FOR ANYTHING OTHER THAN EDUCATIONAL PURPOSES, THE OWNER OF THIS SITE IS NOT RESPONSIBLE FOR YOUR ACTIONS OR ANYTHING AS A RESULT OF YOUR ACTIONS. MISUSE COULD RESULT IN BREAKING THE LAW SO USE IT AT YOUR OWN RISK!! This blog does not encourage, condone, or orchestrate attempts to hack into other servers or any other illegal activities. What is Ethical hacker :An ethical hacker is a computer and network expert who tracks a security system on behalf of its owners, seeking vulnerabilities that a malicious hacker could exploit. To test a security system, ethical hackers use the same methods as their less principled counterparts, but report problems instead of taking advantage of them. Software Programmer,JAVA J2EE Technical Specialist,Ethical Hacker,Cyber Security Expert. Ethical Hacker. Powered by Blogger. THE ultimate port scanner nmap. The one and only NT password cracker L0phtcrack. Get the latest version of john the ripper. The best packet assembler/analyzer hping. Hackers swiss army knife netcat. A tool for network monitoring and data acquisition TCPDump. The ONLY packet sniffer Ethereal. 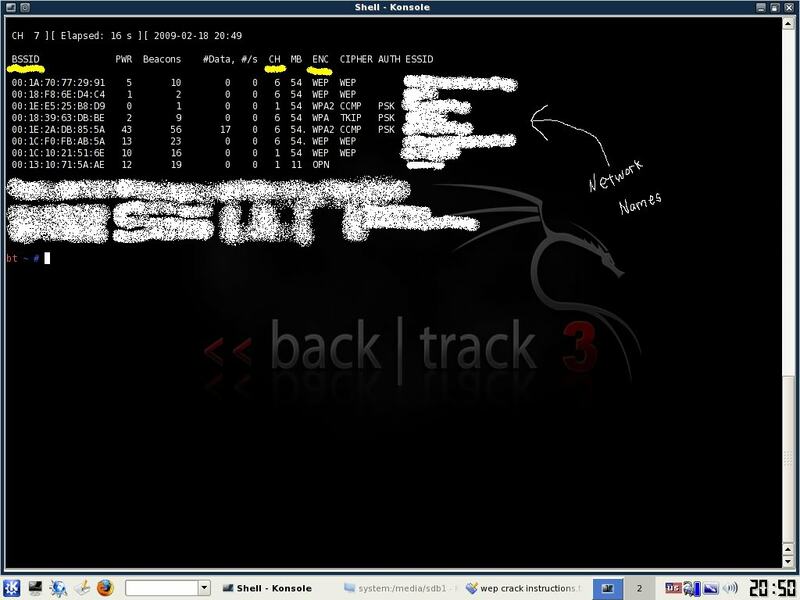 An active reconnaissance network security tool Firewalk. Grep your network traffic NGrep. NIDS tester from NIDSbench fragrouter. The best OS fingerprinter Xprobe. Now let's dive into the real procedure for the SQL Injection. Our best partner for SQL injection is Google. We can find the Vulnerable websites(hackable websites) using Google Dork list. 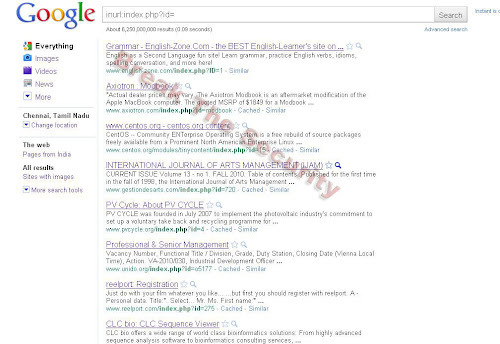 google dork is searching for vulnerable websites using the google searching tricks. There is lot of tricks to search in google. But we are going to use "inurl:" command for finding the vulnerable websites. Change the n from 1,2,3,4,,5,6,...n. Until you get the error like "unknown column ". change the number until you get the error as "unknown column"
if you get the error while trying the "x"th number,then no of column is "x-1". Sometime the above may not work. At the time add the "--" at the end of the statement. Using "union select columns_sequence" we can find the vulnerable part of the table. Replace the "order by n" with this statement. And change the id value to negative(i mean id=-2,must change,but in some website may work without changing). It will show some numbers in the page(it must be less than 'x' value, i mean less than or equl to number of columns). It showing 3,7. Let's take the Number 3. Now replace the 3 from the query with "version()"
if the version is 5 or above. Then follow these steps. Now we have to find the table name of the database. Replace the 3 with "group_concat(table_name) and add the "from information_schema.tables where table_schema=database()"
Now select the "admin " table. Now replace the "group_concat(table_name) with the "group_concat(column_name)"
Copy and paste the code at the end of the url instead of the "mysqlchar"
Now replace the replace group_concat(column_name) with group_concat( columnname,0x3a,anothercolumnname). Now replace the " from information_schema.columns where table_name=CHAR(97, 100, 109, 105, 110)" with the "from table_name"
Once the Parerva development team get their rest, we should be seeing a Maltego 3.1 CE edition surface…we will keep y’all updated once it does. Head down to the Paterva website now, and see the awesomeness of Maltego! This Tutorial explains EVERYTHING in detail So, it is quite long. Enjoy. This Tutorial is in Bt3 But Download The Latest Release Bt4. I downloaded the Dvd iso and burned it to a Dvd. Insert your BT4 Dvd/usb drive and reboot your computer into BT4. I always load into the 3rd boot option from the boot menu. (VESA/KDE) You only have a few seconds before it auto-boots into the 1st option so be ready. The 1st option boots too slowly or not at all so always boot from the 2nd or 3rd. Experiment to see what works best for you. Once in BT4, click the tiny black box in the lower left corner to load up a "Konsole" window. Now we must prep your wireless card. You will see the name of your wireless card. (mine is named "ath0") From here on out, replace "ath0" with the name of your card. Now it's time to discover some networks to break into. Now you will see a list of wireless networks start to populate. Some will have a better signal than others and it is a good idea to pick one that has a decent signal otherwise it will take forever to crack or you may not be able to crack it at all. This will stop airodump from populating networks and will freeze the screen so that you can see the info that you need. Now find the network that you want to crack and MAKE SURE that it says the encryption for that network is WEP. If it says WPA or any variation of WPA then move on...you can still crack WPA with backtrack and some other tools but it is a whole other ball game and you need to master WEP first. The Channel number will be under a heading that says "CH". the FILE NAME can be whatever you want. This is simply the place that airodump is going to store the packets of info that you receive to later crack. You don't even put in an extension...just pick a random word that you will remember. I usually make mine "wepkey" because I can always remember it. **Side Note: if you crack more than one network in the same session, you must have different file names for each one or it won't work. I usually just name them wepkey1, wepkey2, etc. Once you typed in that last command, the screen of airodump will change and start to show your computer gathering packets. You will also see a heading marked "IV" with a number underneath it. This stands for "Initialization Vector" but in noob terms all this means is "packets of info that contain clues to the password." Once you gain a minimum of 5,000 of these IV's, you can try to crack the password. I've cracked some right at 5,000 and others have taken over 60,000. It just depends on how long and difficult they made the password. Now you are thinking, "I'm screwed because my IV's are going up really slowly." Well, don't worry, now we are going to trick the router into giving us HUNDREDS of IV's per second. This will generate a bunch of text and then you will see a line where your computer is gathering a bunch of packets and waiting on ARP and ACK. Don't worry about what these mean...just know that these are your meal tickets. Now you just sit and wait. Once your computer finally gathers an ARP request, it will send it back to the router and begin to generate hundreds of ARP and ACK per second. Sometimes this starts to happen within seconds...sometimes you have to wait up to a few minutes. Just be patient. When it finally does happen, switch back to your first Konsole window and you should see the number underneath the IV starting to rise rapidly. This is great! It means you are almost finished! When this number reaches AT LEAST 5,000 then you can start your password crack. It will probably take more than this but I always start my password cracking at 5,000 just in case they have a really weak password. Once you have done this you will see aircrack fire up and begin to crack the password. typically you have to wait for more like 10,000 to 20,000 IV's before it will crack. If this is the case, aircrack will test what you've got so far and then it will say something like "not enough IV's. Retry at 10,000." DON'T DO ANYTHING! It will stay running...it is just letting you know that it is on pause until more IV's are gathered. Once you pass the 10,000 mark it will automatically fire up again and try to crack it. If this fails it will say "not enough IV's. Retry at 15,000." and so on until it finally gets it. If you do everything correctly up to this point, before too long you will have the password! now if the password looks goofy, dont worry, it will still work. some passwords are saved in ASCII format, in which case, aircrack will show you exactly what characters they typed in for their password. Sometimes, though, the password is saved in HEX format in which case the computer will show you the HEX encryption of the password. It doesn't matter either way, because you can type in either one and it will connect you to the network. Just omit the colons from the password, boot back into whatever operating system you use, try to connect to the network and type in the password without the colons and presto! You are in! It may seem like a lot to deal with if you have never done it, but after a few successful attempts, you will get very quick with it. If I am near a WEP encrypted router with a good signal, I can often crack the password in just a couple of minutes. I will gladly answer any legitimate questions anyone has to the best of my ability. HOWEVER, I WILL NOT ANSWER ANYONE THAT IS TOO LAZY TO READ THE WHOLE TUT AND JUST ASKS ME SOME QUESTION THAT I CLEARLY ANSWERED. No one wants to hold your hand through this...read the tut and go experiment until you get it right. There are rare occasions where someone will use WEP encryption with SKA as well. (Shared Key Authentication) If this is the case, additional steps are needed to associate with the router and therefore, the steps I lined out here will not work. I've only seen this once or twice, though, so you probably won't run into it. If I get motivated, I may throw up a tut on how to crack this in the future. he whitepaper .NET Framework rootkits - backdoors inside your framework.pdf covers various ways to develop rootkits for the .NET framework, so that every EXE/DLL that runs on a modified Framework will behave differently than what it's supposed to do. Code reviews will not detect backdoors installed inside the Framework since the payload is not in the code itself, but rather it is inside the Framework implementation. Writing Framework rootkits will enable the attacker to install a reverse shell inside the framework, to steal valuable information, to fixate encryption keys, disable security checks and to perform other nasty things as described in this paper. This paper also introduces .NET-Sploit 1.0 - a new tool for building MSIL rootkits that will enable the user to inject preloaded/custom payload to the Framework core DLL. Two security researchers open-source code that can be used to take control of versions of the Microsoft Windows 7 x64 operating system. The team decided to release the code despite initial reservations over security. rojan-GameThief.Win32.Magania, according to Kaspersky naming convention, monitors the user activities trying to obtain valuable information from the affected user, especially about gaming login accounts. This long tutorial analyze this malware but is also a general document which explains how to analyze a modern nested-dolls malware. Kernel rootkits have posed serious security threats due to their stealthy manner. To hide their presence and activities, many rootkits hijack control flows by modifying control data or hooks in the kernel space. A critical step towards eliminating rootkits is to protect such hooks from being hijacked. However, it remains a challenge because there exist a large number of widely-scattered kernel hooks and many of them could be dynamically allocated from kernel heap and co-located together with other kernel data. In addition, there is a lack of flexible commodity hardware support, leading to the socalled protection granularity gap kernel hook protection requires byte-level granularity but commodity hardware only provides pagelevel protection. The Stoned Bootkit is a rootkit that is booted before the main operating system has, and is able to stay and hide itself in memory during execution of the guest operating system. The payload is executed beside the running operating system and comes with the bootkit. Stoned is designed to be operating system independent, it is multiplatform. It currently supports all 32-bit and 64-bit Windows systems and Linux. It allows a very wide abstraction of the program and the running base, this means it is a new deployment platform of software. The current proof of concept payloads are a local privilege escalation and a remote surveillance tool. The platform, however is open for third-party future development. The bootkit itself has an integrated module and plugin structure which allows extending its core features without touching the core code. New in this version is that it is totally independent from media, it can be started from hard disk (master boot record), but also CD/DVD/BD or even over the network.